Thanks for the update Sigurd! I think the first chapter was better for me, in my opinion the main issue with this chapter is that you're focusing too much in your OC. The action scene was very detailed and long, which may be good, but I thought that this was other kind of fic. Er... well I have to expound a bit... ^^;; This will be the only chapter to do that .-. so I might as well elaborate on it a bit more... oh and don't worry... focus will soon shift once again to our beloved pairing because I don't plan on expounding on my OC's any more than this... I might do that somewhere else. oh wow. nanoha is a princess...probably cursed by alexis...and now the headmaster (YS) is trying to save the rest of the kids....cooliO!! Maybe you should go check out this summary again? Although I tweaked some things that summary is still quite accurate and the main villain won't change at all. This poem has always resonated in my mind ever since I began studying it. They say a man who was disabled wrote this poem and called it “Invictus” which means unconquered in our language. In this poem he says he never fazed even through the darkest of his times, he continued living his life to the fullest… nothing fazed him even though he was physically disabled already. It’s ironic that this was the last thing I studied before I was turned into stone. The darkness that covered me was my own current reality. I slowly lost hope in ever turning back, after all it’s most likely that it has been several years since the downfall of the kingdom no one probably knows my true identity now except for one survivor: Captain and head librarian Yuuno Scrya, my last teacher and the one who taught me this poem. What are you planning to do now? – The question echoed in my mind. As I flipped through the pages of this diary I began to understand little by little what secrets the house of Alevi and the house of Ventris kept: they both shared the two halves of one sword. One being able to cure all kinds of sicknesses and the other to be able to bring a swift death upon one’s enemy, when combined the sword becomes the infamous demon’s bane: Fomortiis. One of the many things I discovered was that both houses were deeply tied to the royal family of the kingdom of guardians, both families’ sons and daughters were sent to guard the heirs of the kingdom forming a close confidante and ruler relationship between the royal family and both families. Out of all the entries that were posted in the diary I find the final entry to pique my interest… it didn’t look like it was written by the head of the house. It was written by someone else. The handwriting was completely different from the head of the house at that time and the way this person wrote it was also completely different; in the sense that how a particular scene was different from the way the original author would describe it. I only write in this diary for one purpose that is to honor my dead opponent’s wishes. He wished for me to record how he died. I am ordered to do a number of things in this city of guardians. I am to acquire the swords both the Alevi and the Ventris family possess, to slay the royal family and both the Alevi and Ventris families as well, and to search for my mistress’ objective. Killing most of the families were easy. However, as I was about to attack the royal family’s princess I was stopped by who was seemingly the captain of the royal guard. “Out of my way.” I ordered. “I don’t think so… Er… would ya mind givin’ me yer name missy?” He said in a carefree way. Strange. He seemed not to care whether I was the enemy or not, his manners apparently mattered more to him. I didn’t reply. I knew I was to answer to no one but my mistress. So instead I attacked him and our blades clashed. “Yer forgetting yer manners Alexis.” He said sternly. I was not to answer to anyone. I was to follow my orders and get this over with. Steel continued to clash until I finally caught my dagger to his side which was followed by my sword stabbing all the way through his stomach, making him collapse. “Heh… I guess this means you’re better than me Alexis. Could ya do this old timer a favour and write in the family journal, accounting what happened ‘ere.” He said, staggering in between his breathing. “I will.” I replied flatly. “Dea bless yer soul… run, princess… r…un…” These were his final words. I heard clapping from behind me. It was my mistress… I do not know why she is here but I do know that she was here because she was either to do something I could not or retrieve her objective. “It seems our princess is left… and she possesses some power we don’t want hindering us in the future…” She raised her right hand and made a purple ball of energy appear. Right before my eyes I saw the princess turn to stone little by little. And this ends the accounting of this incident. It just stopped there. Someone named ‘Alexis’ wrote this but she left out a lot of details. I wonder if the princess she was talking about was Nanoha though… I do want to solve this mystery as fast as possible. I was not really going to settle leaving this academy without her. I wanted her to be able to live and breathe again. It was sad to see her in this state. “What are you reading, Fate?” Came Sigurd’s voice from behind. “Eh… a diary? The one you told me to read?” I replied casually. Her eyes widened. “What?! I thought that was on the restricted section?” She pondered out loud. “Going to visit?” She asked. “Yeah… I need some answers.” I replied. Right… And just like that I made my way to the shed where she was being kept in. I had to know what I needed to do. ‘Nanoha?’ I called out mentally. ‘Yes, Fate?’ Came the response from Nanoha. 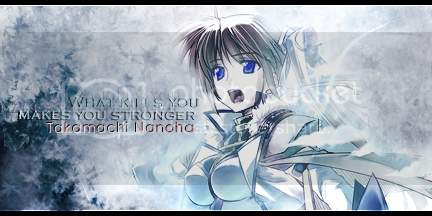 So Nanoha is much more than we tought, wonder what power she have that needed her to be sealed in stone. I feel jipped somehow but meh, still not my story. Even so Siggy I hope you continue this and put more effort into your updates, this felt really, really rushed. ah so short ;P but thanks for some explanation of what's going on. i hope u update soon!